Tuna Dan, who had been selling tuna at the Port Angeles Farmers' Market, is now selling salmon. 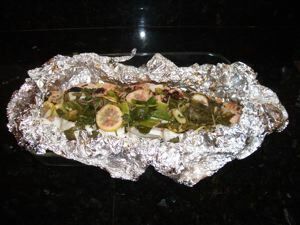 We bought a whole fish from his chest, and then stuffed it with herbs, smoked paprika, scallions, coriander and thin slices of lemon. We wrapped it in aluminum foil and hot smoked it on our Weber kettle grill for a bit under an hour. We started with a hot fire, but put the lid on with the little dial wide open. It was delicious. Thanks, Tuna Dan. We were recently out at Dungeness Valley Creamery, and as well approached we noticed a cow lying on her side in the field near the farm store. We had never seen a cow on her side before. She wasn't down on all four, but on the ground lopsided as if she had fallen on one side. Curious, we asked about her. It turns out, she was extremely pregnant and about to deliver. 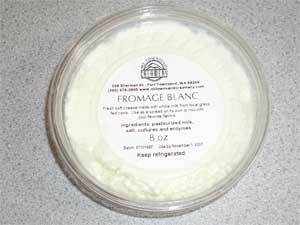 We bought some milk, and some cheese, and did some Christmas shopping for a friend of ours. Meanwhile, we could look out the window and watch the cow having contractions as she tried to deliver. It looked like hard work which is probably why they call it labor. One of the spectators, not one of us, remarked that it looked like she was having a cow, which indeed she was. Suddenly, after a series of contractions, the calf was ejected. It was wrapped in a membrane and looked like something from a science fiction movie, perhaps Calf Cocoon II - The Cow Horror Continues. The calf didn't move much, but we could see she was breathing. Sarah Brown went to check her and announced that the baby was a girl, and then left her with mom. Grandma was in the next field bellowing advice, and she was joined by a few other cows who watched for a while and then drifted off. Meanwhile, Mom set out to the serious business of licking her newborn while her newborn tried to figure out how to stand up. We watched for a good half hour. Mom did a good job licking, and the cocoon disappeared to reveal a wet calf. Then the wet calf turned into a dry calf despite all the licking. Meanwhile the newborn rested a few minutes, then tried to stand, then rested a few more minutes, and so on. In the nature documentaries, they use ellipsis. A calf is born, then the calf stands on its shaky legs and nurses. 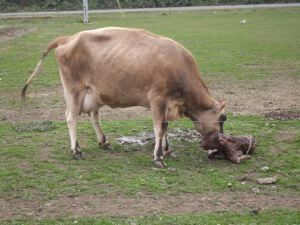 With Dungeness Valley Creamery milk the calf had additional impetus to get to the nursing stage. First, the calf tried her front legs a bit. Then, after a lot more licking, she tried her rear legs and actually managed to get her hindquarters in the air. Unfortunately, standing requires all four legs working together. It takes a human baby with our incredibly advanced brain, and only two legs to deal with, the better part of a year to get this right, so we were probably expecting a bit more than a calf with a cow brain and four legs to deal with could accomplish quickly. We hung around for the next half hour trying to be encouraging, and there were definitely signs of progress. Mom seemed to have satisfied herself that her baby had been adequately licked. Her calf could rise on her hind legs, and we could see her struggling to get her two front legs into position for that critical coordinated push. All of the other cows had left some time ago leaving mother and child on their own, or rather, with us humans and our longer attention spans. We had other errands to run, so we decided that things were likely to turn out for the best. Sarah, having determined that the newborn was a girl, wasn't worried, and the calf looked helpful, so we assume that things worked out for the best. The difference between the north slope and the south slope of a mountain or ridge is often used as a metaphor. 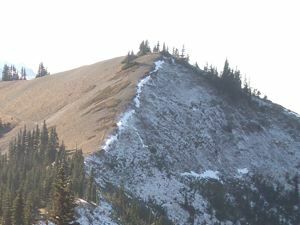 The south slope, or south face, gets a lot more sun in the Northern Hemisphere, so it tends to be drier in the summer, but the snow melts more quickly in the winter. The north slope, or north face, gets less sun, so it tends to be wetter and cooler in the summer, but snowier and harsher in the winter. You should be able to see the difference for yourself in this photo. The first time you visited Hurricane Ridge, you probably climbed to Sunrise Point, and you may even have gone some ways on the trail that leads to Klahane Ridge. To be honest, we haven't taken this trail in years. 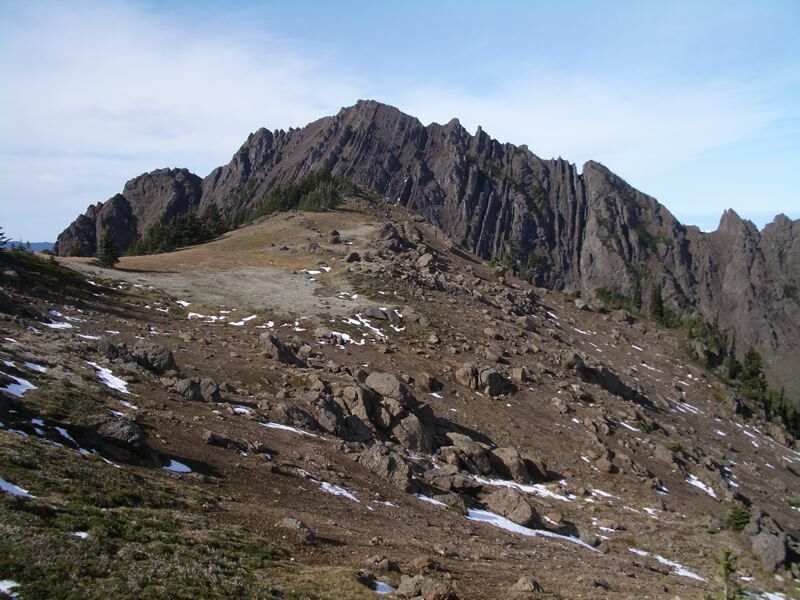 We like to climb the Switchback Trail to Klahane Ridge, and since the Sunrise Point Trail starts right at the lodge, we've been considering it a bit tame. This week, the high country opened again. The snow had melted from the hills, and the ice had melted from the road. The twisty little road to Hurricane Hill was closed, and Obstruction Point Road was closed for the season, so we decided to climb up to Sunrise Point and then see where the trails took us. The day was spectacular, with the sky blue and the snow on the mountains white. 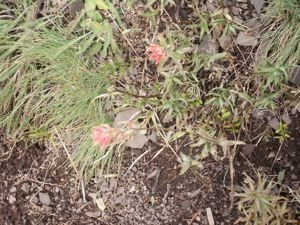 Even a tame trail in the Olympic high country offers a lot of great stuff to look at. To share the experience, we took a few panorama photos. If you click on the little preview you should get a larger version that you can pan across in your web browser. It isn't the same as the real thing, but it might give you a sense of the view from Hurricane Ridge. Along the ridge - click on the picture for a bigger version that you can pan horizontally. 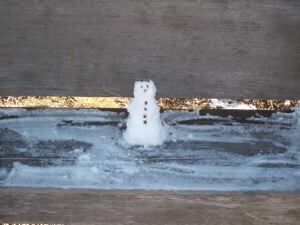 We saw the first snowman of the season up on Hurricane Ridge. 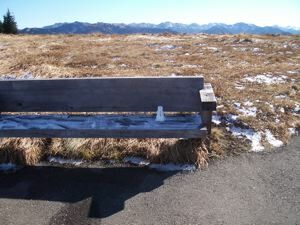 We have no idea of who made him, but there he was, sitting on a bench enjoying the view. 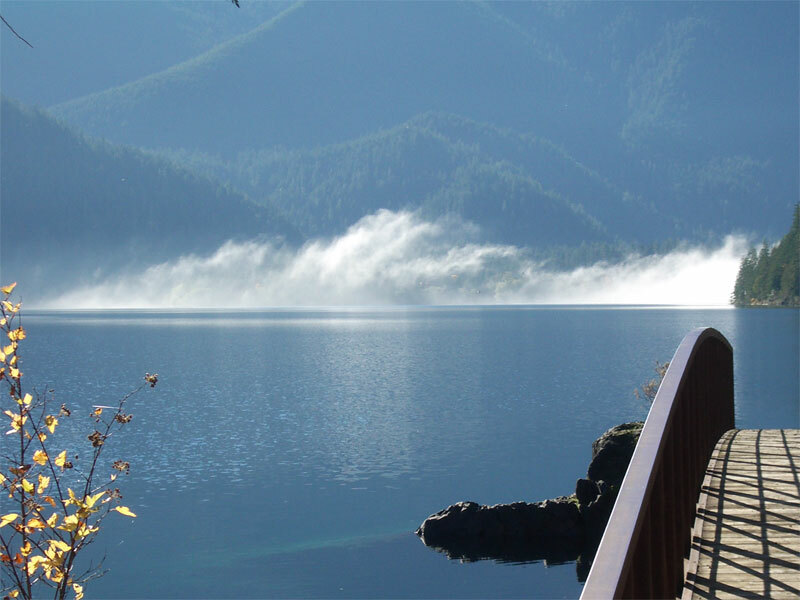 There is nothing like the morning mist on a mountain lake. The winds were calm, and Lake Crescent was placid. We were on the Spruce Railroad Trail, and this mist emphasized the quiet of the day. As we walked west the mist thickened and rose. Less than an hour later, near the end of our trail, the mist had evanesced. We were in Seattle recently on a shopping expedition and we couldn't help noticing this pink elephant not far from Seattle Center. 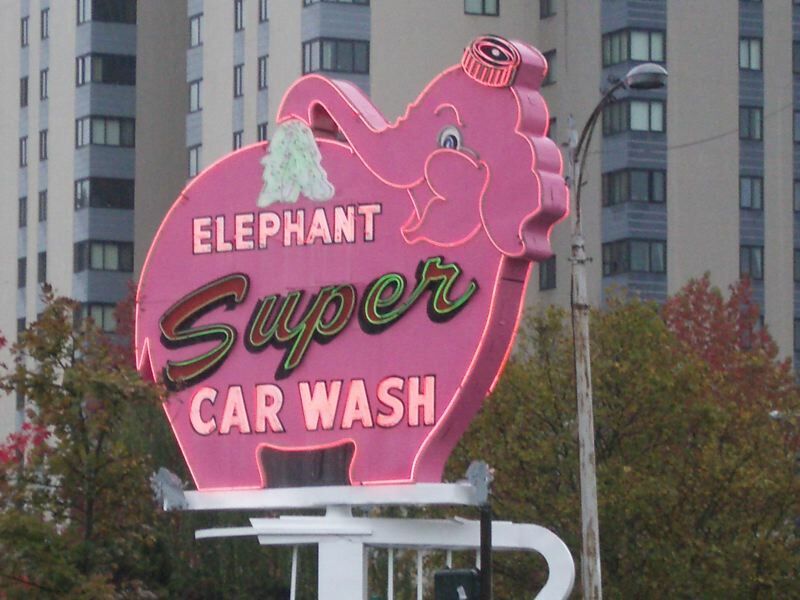 Apparently, this is a chain of car washes. We saw another one down near Safeco Field. If you keep your eyes open, there is still lots of great neon signage around. 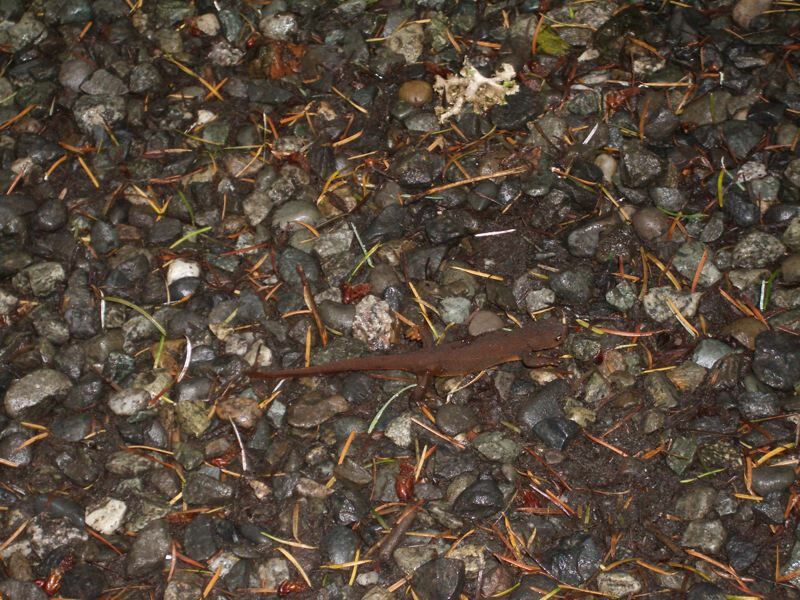 The Morse Creek Trail is what passes for an urban trail out in Port Angeles. 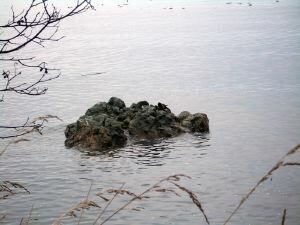 It runs along the water from downtown near the Red Lion, the Victoria ferry docks and The Landing, past the Hospital, and then along the base of the bluffs before turning inland a bit before Morse Creek east of town. We tend to drive east on 101 to Morse Creek and park in the little parking lot there. We head west, crossing the wooden railroad bridge which was restored by local volunteers, and then down to the water. Given that the town is hard by a National Park full of some of the greatest wilderness in the lower 48, walking the Morse Creek trail still manages to take one away from it all. 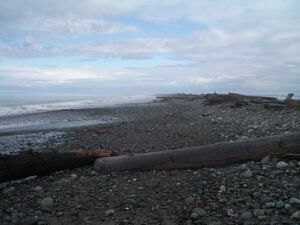 There is a little beach where the trail meets the strait, then a crumbling dike which is washed by the waves on stormy days. A bit past here, the trail is paved, so it makes a great bicycle trail. The view is of Ediz Spit with the Coast Guard Station, alien Canada and the city of Victoria, the San Juan Islands, the Strait of San Juan de Fuca itself, and in the distance Mount Baker looming like a meringue. 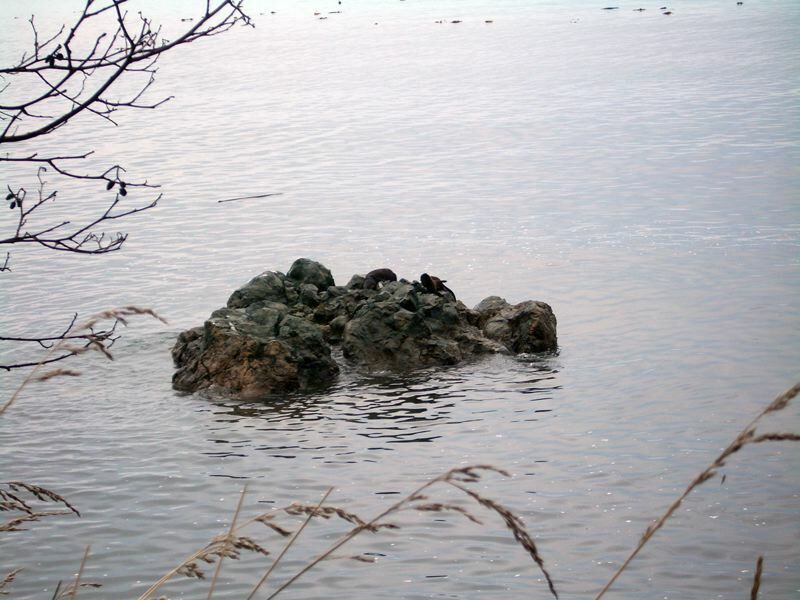 There is also a lot of kelp which we tend to mistake for sea birds, and there is a bunch of rocks (see the picture below) which is now and then inhabited by local river otters (see pictures to the right). 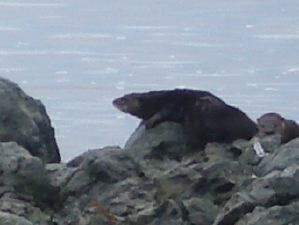 The otters aren't on their rock all that often, but when they are, it is a special treat. Obstruction Point Road was open again so we shot out for a last peek at the high country. The road isn't much. It's about 1.5 lanes wide, and, now that the autumn rains are upon us, it is getting a bit rutted and here and there large rocks have settled on the roadway. Still, the road was passable, so we went out and took a short walk, and we took some pictures which we've turned into panoramas. This is a panorama view from up on Hurricane Hill. We were up there on a gray day, and the sun was just leaking through the clouds. The grasses are turning golden, and there are a few ice crystals on the ground. Autumn is coming to the high country. Click on the image for the huge, full resolution 6000 x 1900 panorama. Hurricane Ridge Road had been closed, and we were sure it had been closed for the season. We were wrong. The road is open, so up we went to Klahane Ridge. This has been an odd year. We missed the usual late summer drying. 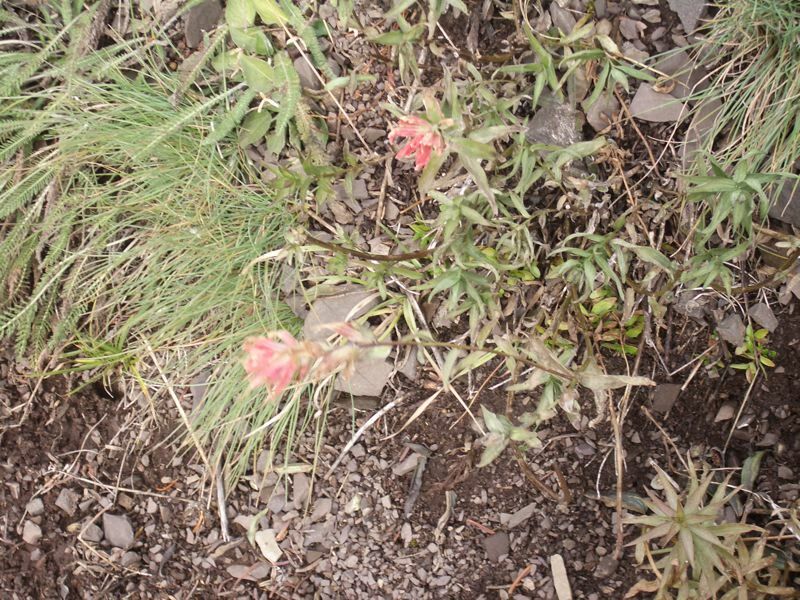 By September, most of the alpine flowers are past their bloom and rather sere. 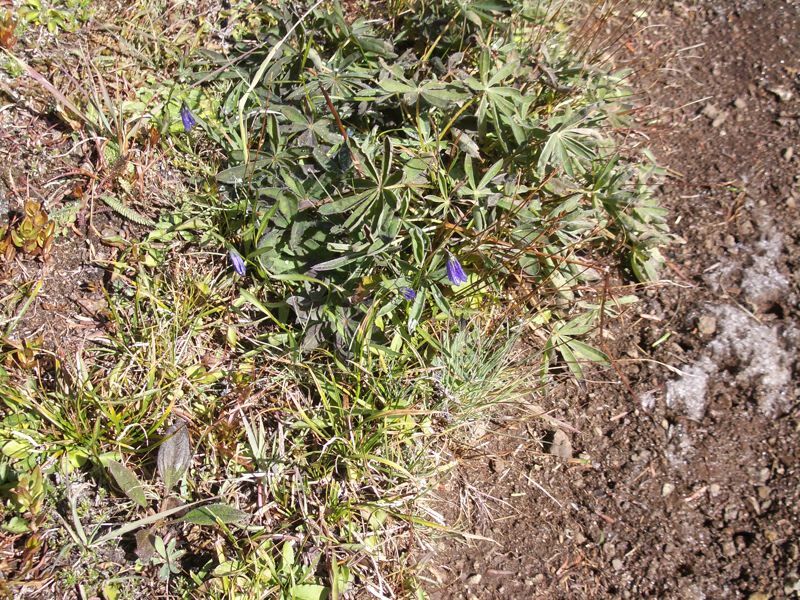 This year, the lupines were blossoming into autumn, and the hillsides covered with flowers. 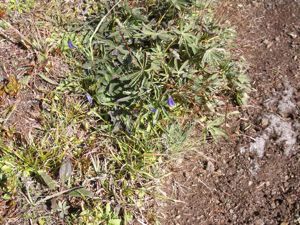 The lupines are gone, but even in October, there are a few blossoms - yarrow, Indian paintbrush, and even a few of those violet harebells. There was a bit of ice on the trail, and some slushy segments. The ice freezes under the soil. 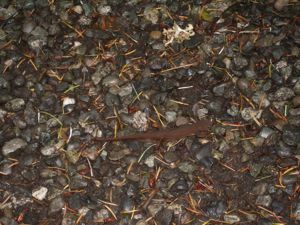 When you step on it, the soil compacts and the water flows making the ground slippery. Slime ice, we called it, but it dries out in an hour or two and turns into good old fashioned mud. We aren't sure of how much snow has fallen in the high country. Obstruction Point Road is closed, but it is a rather twisty, unsealed road, so there may just be ice in one of the dark patches. 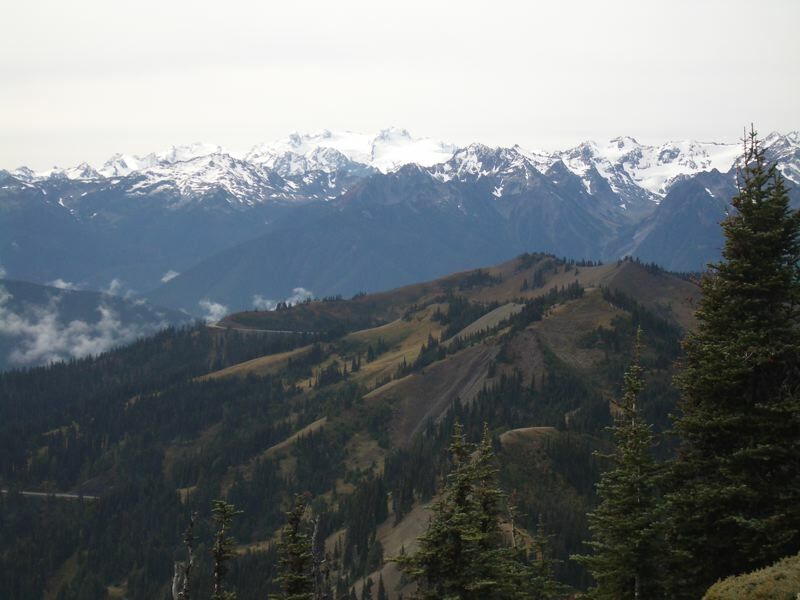 According to the web camera at Hurricane Ridge there has been a bit of snow at 5200 feet, but it has all melted. Even at Klahane Ridge, on the north face, perhaps at 6000', there are just patches of snow. Still, looking across at the Blue Glacier and Mount Olympus, over 7000', the mountains are looking whiter. The winter season is here. There is snow in the mountains. 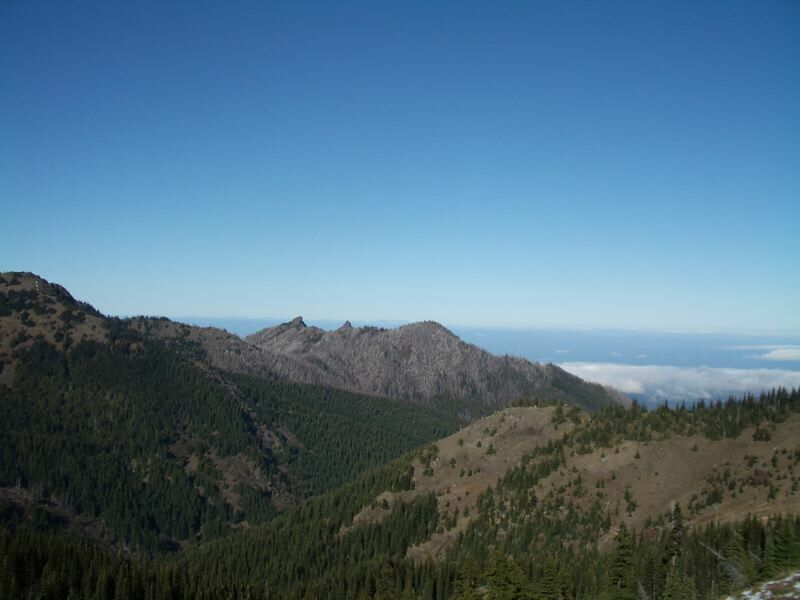 Hurricane Ridge Road has already been closed for the season, though it may reopen. 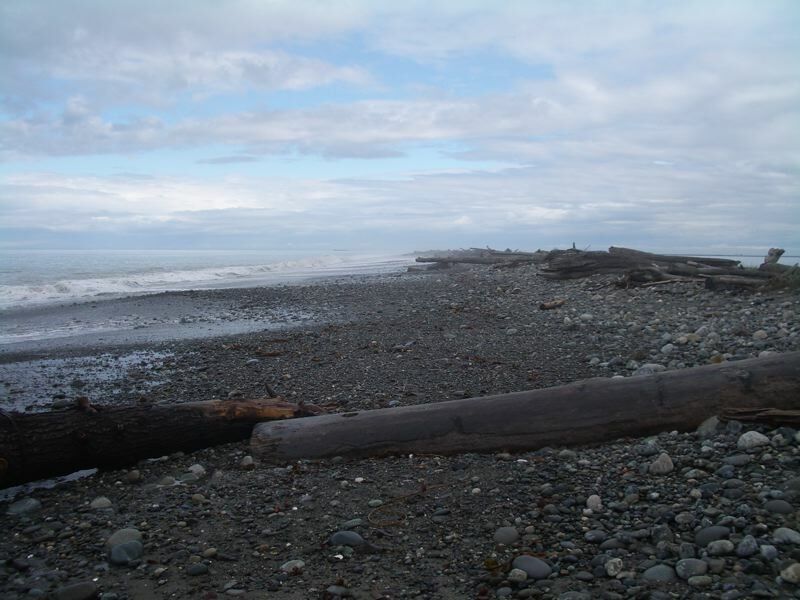 Low tides at the Dungeness Spit are rare and the sand is vanishing from the beach. The spit is still passable, but there are long rocky stretches, so we will have to plan our treks to the lighthouse carefully. 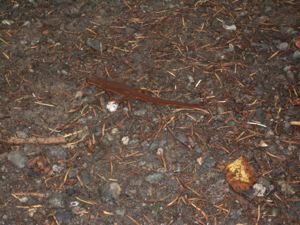 On the more positive side, we saw our first Olympic salamanders on the trail to the spit. There is a half mile trail through the forest from the parking lot to the descent to the spit proper. 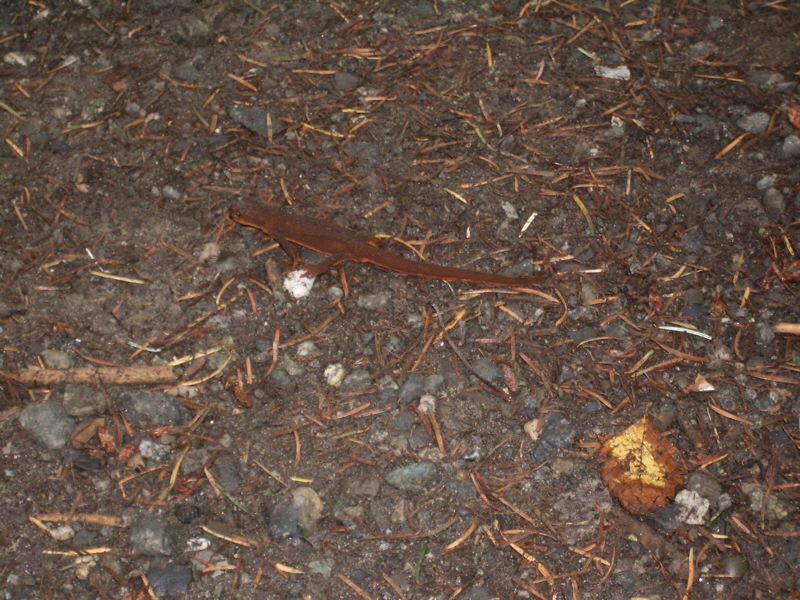 We've been taking it for years, but this was the first time we saw our familiar little friends from the Spruce Railroad Trail, Olympic salamanders. They really are that rusty orange, and they were obviously out enjoying the wet. 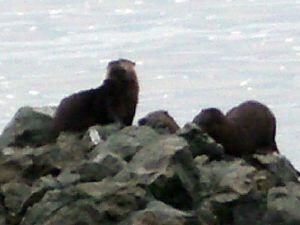 We don't expect them to be out much longer with the colder weather coming, but it was neat seeing them skulking about. This is one of our favorite dishes from Paula Wolfert's book on Moroccan cooking, Couscous and Other Good Food from Morocco. It's easy to make if you have a good steamer or a couscousiere. 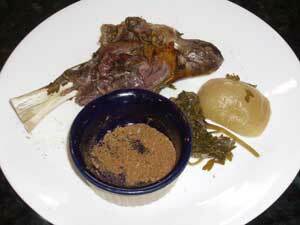 Get yourself from four to six lamb shanks, a fistful or two of parsley, a couple of onions (peeled), some good saffron, black pepper and perhaps half a stick of butter, maybe a bit less. Squeeze the butter until it softens, sprinkle on the saffron and pepper, then smush and fold a few times to make saffron-pepper butter. Now, set up the steamer with lots of water. The cooking time is an hour and a half to two hours. You want the shanks tender. Rub the shanks with the saffron-pepper butter. Put the parsley in the steaming basket as a base layer. Then put in the shanks and the peeled onions. Seal the thing up. Check now and then to see if the steamer needs more water, and after 90 minutes start checking to see if the meat is falling off the bone. When the shanks are ready, mix a few teaspoons of ground cumin with some salt to make the dip. Use gray salt, fleur de sel or kosher salt for better balance and a nice crunch. This is an amazingly good dish. The lamb will be silken and redolent of saffron.